iPad Kindle Comparison - which makes a better reader? A number of people have asked me how I like reading on the iPad. My response is usually something along the lines of, I like it, but I like reading on the Kindle better. The reason I like reading on the Kindle better is it reads more like paper, but let me explain a bit more about what I mean by that. I stare at a computer screen for many hours every day. During all of that time, the light from the screen is shining out from whatever I'm reading or watching, which is gradually fatiguing to the eye. With the Kindle I don't get that same perception of fatigue. The trade paperback colored screen with crisp black text is easy on the eyes in the morning as I start my day and remains easy on the eyes as I'm closing out the day preparing to sleep. Screen design and text implementation aren't the only factors that make for a good reading experience. The iPad has outstanding battery life, as does the Kindle hardware. Both are good for several days of casual usage on a single charge. Because the iPad has that beautiful large display, it requires a fairly significant battery to achieve that long life. A large battery translates to more weight. Holding a Kindle in one hand and iPad in the other, the weight difference is glaringly obvious. 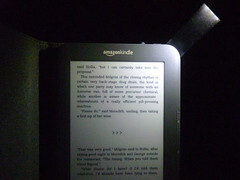 The Kindle feels like you are holding a magazine or a section of the paper folded over in your hand. The iPad feels heavy in one hand. Another important difference between the screens is the ability to read anywhere. In the dark with no case, the iPad wins for reading because it provides its own light source. In bright sunlight the Kindle reader wins because you won't be able to see anything but your own reflection in the iPad. If you get the Kindle case with built-in light, which adds a small amount of weight but still keeps the Kindle lighter than an iPad, the Kindle becomes more versatile than the iPad. Neither device has a great solution for reading while in a bath. 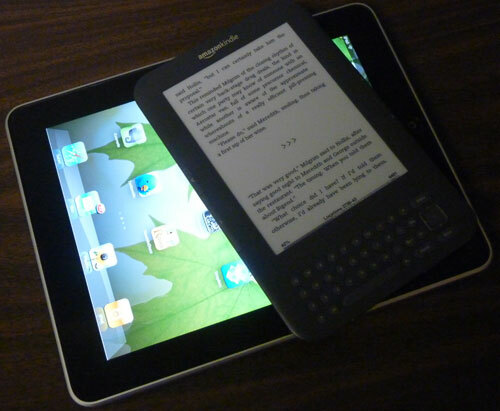 Portability is another factor where Kindle outperforms iPad. I can put the Kindle in the pocket of my cargo pants. An iPad is simply too big. If I want to travel light, the Kindle for reading, coupled with a smartphone makes a better pairing. When someone asks me if they should buy a Kindle or an iPad, I ask them what they want to use the device for. If they only want a reader, the Kindle wins. If they want a multifunction device that also happens to function as a reader, I say get both. The iPad is great in a pinch if you forgot your Kindle, but for reading text the Kindle is a better option.